These are all the Blogs posted in May, 2014. 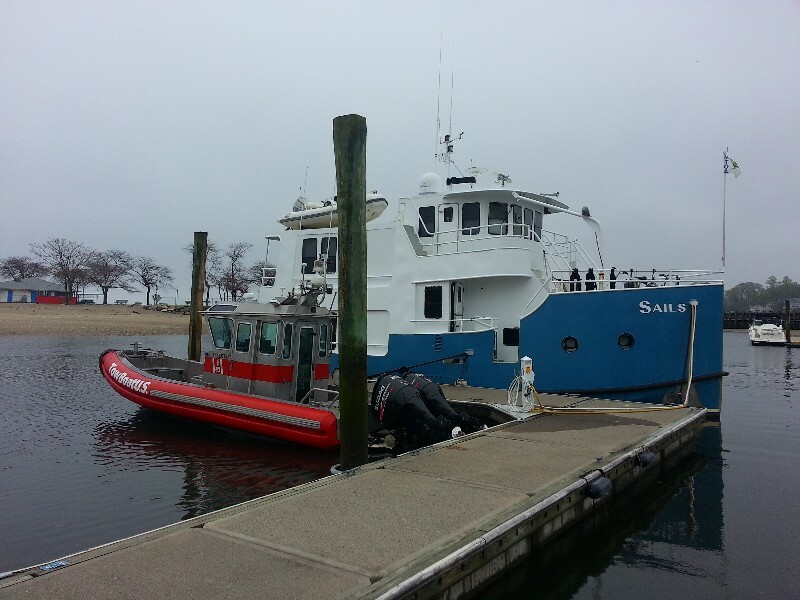 We departed from Punta Gorda, FL on March 31, 2014 and arrived to Stamford, CT on May 7, 2014. 6 days on the hard at the Gulf Marine Ways, Fort Myers Beach, FL. 1 day in Oriental, NC for pleasure. 3 days in Smithfield, VA waiting for weather. 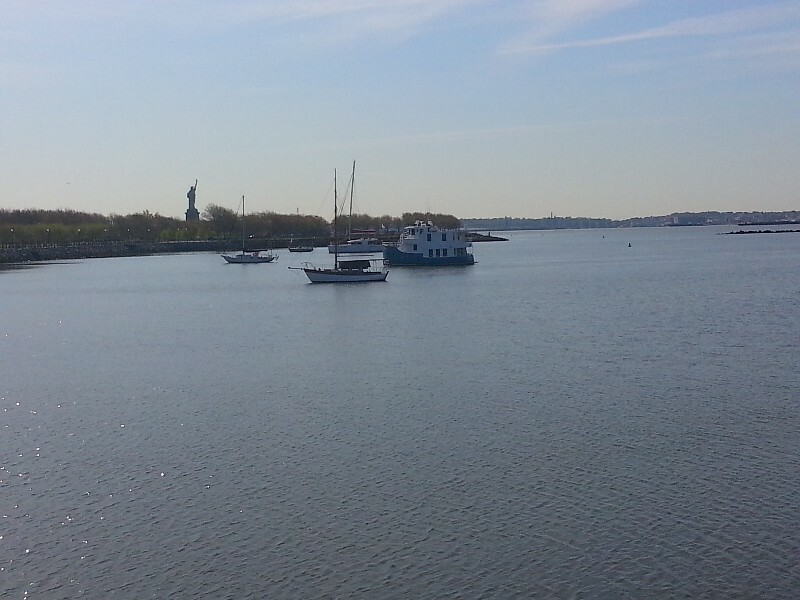 We got to sleep in this morning as we had to wait for the correct tide to transit the East River to Long Island Sound. No alarms... just wake up whenever... of course we both are awake at before 0600 but it was a lazy morning. For favorable current up the East River we needed to be at the Battery Manhattan two hours after low tide... low tide at the Battery was 0940 so we would get to the Battery at 1140 or close to that time. We took Beecha to land for a nice long walk and I snapped this photo of SAILS anchored. We were the only power boat in the anchorage. We pulled anchor about 1040 and headed slowly toward Manhattan and the mouth of the East River. At 6.5 knots it would of taken us maybe 15 minutes to get there... we had an hour before needing to be there... so we went at a snails pace... 2 knots or so and enjoyed the sights of New York Harbor. The water taxis and ferries zipping in all different directions and the helicopters coming and going are just amazing. We actually had current against us coming out of the Hudson River in to New York Harbor so going slow was not a problem. WE arrived to the Battery at about 1130 and the current directions switched from on our bow to the stern and pushing us at over 8 knots initially... as we proceeded up the East River and through Hell Gate we were soon running over 10 knots... even after Hell Gate we maintained speeds over 8 knots all the way to the Throgs-Neck Bridge and Long Island Sound. We lost a lot of the speed boost there, but we still ran over 7 knots the rest of the way to Stamford. We arrived to Stamford at approximately 1540 docking at our home for the summer.... Seaview House Marina in Westcott Cove. 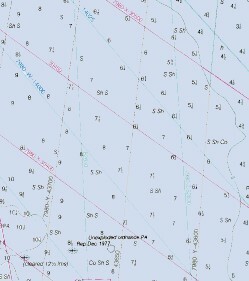 Our position for the next several months... N41°02.387', W073°31.304'. We traveled today for 5 hours covering 36.3 nautical miles averaging 7.3 knots. Up before sunrise and off the dock at 0545 this morning… another long day to day heading to New York. Winds forecast out of the NW 5-10 knots increasing to 15-20 with gusts to 25 knots in the afternoon. So, we wanted to get the early start to beat the increasing winds. 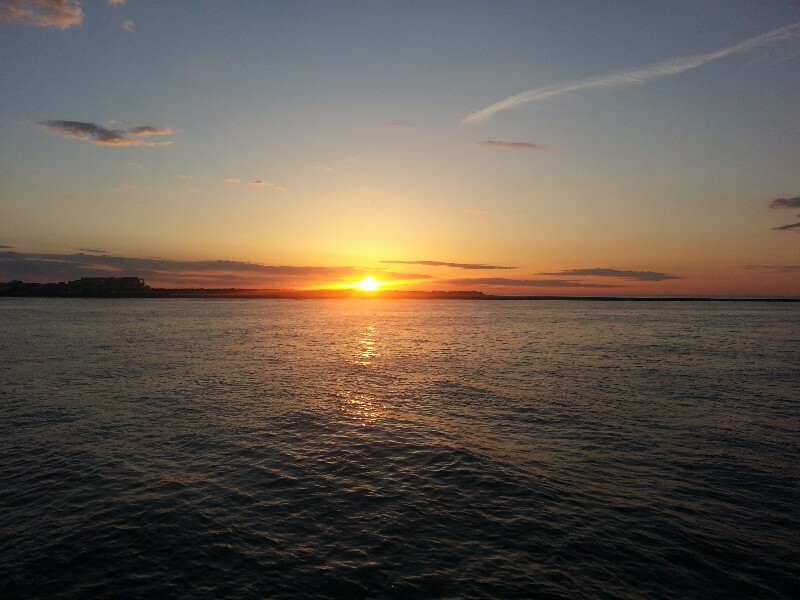 Beautiful sunrise again this morning heading out of Absecon Inlet toward the Atlantic and no wind… Inlets always tend to be a little confused and we had some funky swell action in the inlet… but the ocean was almost flat calm once we cleared the inlet. We had some help with current exiting the inlet but lost most of it after turning to the north… but we did have a slight boost all day pushing us over 7 knots. The winds did pick up after the sun was fully up and were blowing as predicted NW 5-10 knots so we stayed close to shore… typically about 3 miles off the coast. We were doing great and making great time and right at Barnegat Light Inlet… Susan’s favorite inlet… NOT… LOL We were hailed on the VHF by the Coast Guard… there were along side in a small boat… 25’ Safe Boat… they asked us to come to a stop as they wanted to board us for a safety inspection… UGH! There were 4 people on the boat… 2 men and 2 women… they boarded us at the stern via the swim platform… the two men came aboard and the women stayed on the Coast Guard vessel. They inspected the bilge areas… wanted to be sure we were “sea worthy” was the reason given… I think looking for contraband… we keep that hidden real well… LOL anyway, they did the other safety things… PFD’s, signal device (horn), etc… filled out the boarding form and gave us a copy and they were off… about 30 minutes total. We heard them after that hailing several other boats for boarding. We continued on and the wind did pick up to the 15-20 knots plus some as we approached New York… the current also switched and was on our bow… 5.5-6 knots for the last hour and half. 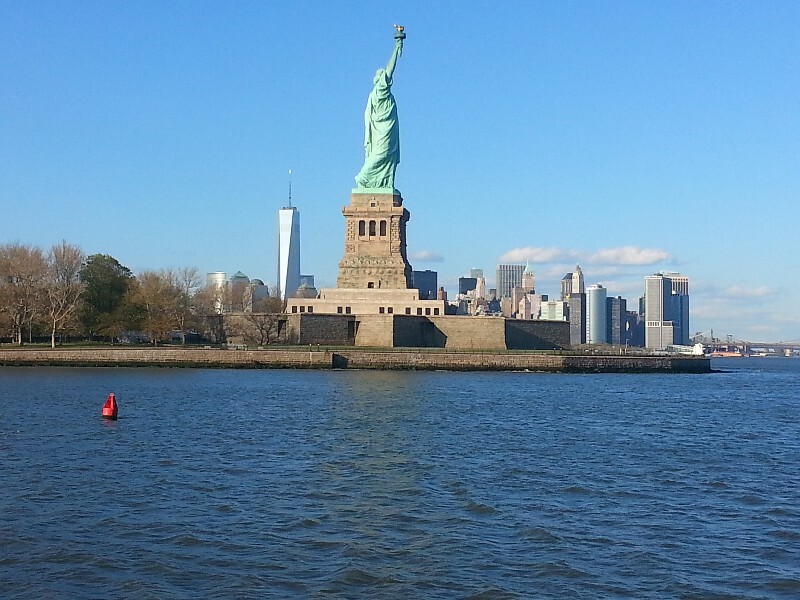 We arrived to New York and anchored behind the Statue of Liberty at 1830… Liberty State Park… N40°41.762’, W074°03.867’. We traveled today for 12.75 hours covering 89.4 nautical miles averaging 7.0 knots.